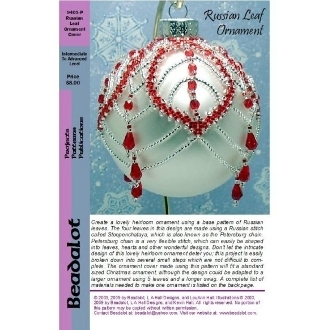 Create a lovely heirloom ornament using a base pattern of Russian leaves. The four leaves in this design are made using a Russian stitch called Stoopenchataya, which is also known as the Petersburg chain. Petersburg chain is a very flexible stitch, which can easily be shaped into leaves, hearts and other wonderful designs. Don’t let the intricate design of this lovely heirloom ornament deter you; this project is easily broken down into several small steps which are not difficult to complete. The ornament cover made using this pattern will fit a standard sized Christmas ornament, although the design could be adapted to a larger ornament using 5 leaves and a longer swag.